The tropical twilight was slowly turning into a beautiful morning. It was Sunday, December 7, 1941. For the first time since Independence Day, all eight battleships of the United State's Navy's Pacific fleet were at anchor around Ford Island in Pearl Harbor, Hawaii. Inside the city, the citizens were awakening to a warm day in paradise. Aboard ships, those sailors who had not spent the evening in town were preparing for a relaxing day. Aboard the U.S.S. Nevada, the last ship in the line, flag raising ceremonies had begun. Later in the day, the sailors would be enjoying a tennis tournament. At 7:58 A.M. paradise was shattered. The first of two separate waves of Japanese fighters and bombers unleashed death and destruction on the city below. 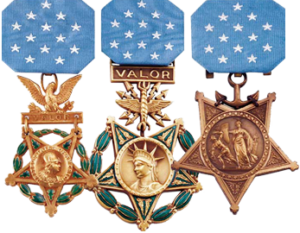 Amid the bullets raking her deck, the men of the Nevada stood in formation without breaking ranks until the flag had been raised and the "Star Spangled Banner" finished its refrain. Then they begin what ultimately became a two-hour struggle for survival. They watched in horror as the first bombs hit their sister ship the U.S.S. Arizona. A few minutes after 8 A.M., the Arizona sank beneath the surface of the harbor taking 1,103 men of its 1,400 crew to a watery grave. Caught completely unaware, the devastation was unbelievable. By 10 o'clock, seven of the Navy's heavy battleships had either sunk or were severely damaged. Of 394 airplanes on the island, 140 were destroyed and 80 more damaged. The island lay in smoky ruins, 2,330 Americans killed, 1,145 wounded. Smoke from the Arizona filled the morning sky bearing mute testimony to the total destruction wrought by the enemy. But through the pall of smoke one image remained, the flag of the United States of America. It was the one symbol of hope, a reminder that freedom had survived and would ultimately triumph. When it seemed that all hope had vanished with the last wisps of smoke from the Arizona, the Red, White, and Blue still waved over Hawaii. Four years of warfare followed that fateful day of December 7, 1941, the day that President Franklin D. Roosevelt said was "a date which will live in infamy." More than 16 million American men and women rose to the defense of freedom during World War II. Almost 300,000 gave their lives, twice that number suffered wounds. On August 10, 1945, another bombing raid made history. This time it was a single aircraft...and it was American. Four days after the "Enola Gay" dropped a single 10,000-pound bomb on Hiroshima, Japan accepted the terms of surrender that ended World War II. On that historic day, the flag flying over the White House in Washington, D.C. spoke of a Nation's will not only to win, but to survive the most horrible adversity. It was the very same flag that had flown over Pearl Harbor four years earlier on December 7th, and survived that day of infamy. Just as the flag that had flown over Pearl Harbor that December morning came to represent a Nation's resolve to "rise from the ashes" and fight to defend all it held dear, this flag also became a flag of peace. The flag of Pearl Harbor was present in San Francisco for the United Nation's Charter Meeting. Though it was Sunday, the flag of the United States flew proudly in the wintry breeze of Washington, D.C. that December afternoon. Most of the residents of our Capitol had returned from attending church and were enjoying lunch, unaware of the destruction and death suddenly unleashed half a world away. When the news finally broke, the citizens went into a frenzy, pressing against the gates at the edge of the White House lawn or silently glued to their radios. Mixed with the sadness were fear and uncertainty. As in Hawaii, the one symbol of hope was the sight of the Stars and Stripes still flowing in the breeze over the seat of our Nation. As it had inspired Francis Scott Key more than 100 years earlier when it survived the assault on Fort McHenry, the symbol of our freedom once again inspired the Nation by its very presence. On Monday morning, December 8, 1941, President Franklin D. Roosevelt asked Congress to declare war on Japan. Before doing so, however, he took a rather unusual step. Though normally the flags flown over our Capitol are changed regularly, on this day the President spoke to his Nation under the same flag that had flown the previous day. That same flag flew again three days later when the Declaration of War was extended to include Germany and Italy. Then the President took personal care to preserve that historic flag. He called it the "Flag of Liberation" and took it with him on many historic occasions. In January 1943 President Roosevelt and British Prime Minister Winston Churchill traveled to French Morocco to attend the historic "Casablanca Conference." One of the key issues was the pledging of the resolve of the British and American people to fight to victory in Europe. Whether as a symbol of that resolve or as a personal symbol of the American commitment to survive utmost adversity, President Roosevelt carried his "Flag of Liberation" with him to Casablanca. Two years later President Roosevelt's Flag of Liberation was unfurled to the breeze once again. 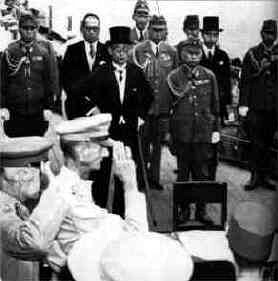 Having accepted surrender terms on August 14, 1945, the Japanese had yet to sign the documents of surrender. On September 2nd the new battleship Missouri was anchored in Tokyo harbor. Aboard was General Douglas MacArthur. With him was the last of America's "fighting generals", Jonathan Wainwright, emaciated after surviving three and a half years of torture as a Prisoner of War. He had been released from the prison camp in Manchuria on August 19th and arrived at Yokohama just two days prior to the historic meeting on the Missouri. Slowly, two Japanese men in suits and top hats walked across the deck with their entourage. They were there to sign the surrender documents officially ending World War II. If they chanced to glance up as they approached Generals MacArthur and Wainwright they'd have seen the Flag of the United States of America waving proudly from the mast of the Missouri. It was President Roosevelt's "Flag of Liberation".